As an internationally renowned pianist, Marc-André Hamelin naturally often uses our editions. He is also greatly respected by G. Henle Publishers on account of his fingerings, which he has contributed to individual Urtext editions. He has just finished recording a CD with Les Violons Du Roy under the direction of Bernard Labadie in Palais Montcalm, Quebec City, Canada. The programme comprised three piano concertos by Joseph Haydn. Sadly, we’ll have to wait until next year until we can listen to this recording, made in a hall famed for its acoustics. It will be released by Hyperion. 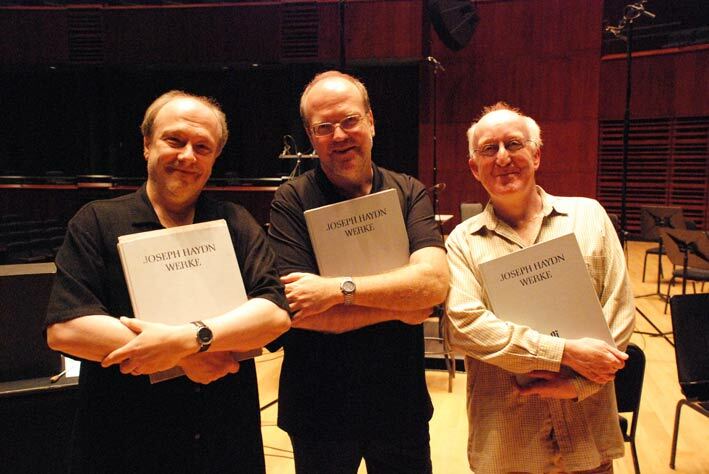 But at least we can share a snapshot that was taken at the end of the recordings: Hamelin, Labadie and the producer Andrew Keener (from left to right): three Haydn experts with the volumes from the Haydn Complete Edition.